Accommodation is based on 4-star accommodation. However, please note that accommodation in Verona is 3-star accommodation and in Cortina D'Ampezzo is 3-star superior accommodation. Departure at 8:30 am from Starhotels Ritz in Milan to the Lake Orta, a small and charming lake situated in the North-eastern side of the region Piedmont. Stop in the beautiful village of Orta San Giulio for a short visit. Then, tour by private boat to reach the island of San Giulio, just in front of the village: it is the pearl of the lake, almost entirely occupied by the Monastery Mater Ecclesiae, famous for studies on antique books. After a short visit, back to Orta and departure by bus to Stresa, on Lake Maggiore, one of the largest Italian ones. Wedged between the foothills, and of clear glacial origin, it is framed in its lower section by the soft hills of the region of Novara, and in the upper section, by high mountain peaks, some of which with perpetual snow. These features make possible an average temperature during all seasons, milder in winter than in the inner areas and cooled down in summer by the breezes that blow on the water’s surface changing its colour. Due to its mild climate, many species of flowers and plants typical to the sub-tropical climate could adapt to the lake areas climate. Arrival in Stresa, an international tourist resort situated in a central but also panoramic and picturesque position along the lakeside roadway, stands just in front of the ‘Borromee’ islands. Free time for lunch. In the afternoon, a tour of the Pescatori island (Fishermen island) by private boat. The island was named after the main activity which over the centuries has characterized this fishermen town. Although only a few families still maintain the original activity, the identity of the small community appears intact. Tourists are fascinated by its simple houses, the narrow lanes, the stone portals and the attractive underpasses. We will continue to the Bella Island. Return to Stresa. At the end of the visit, departure to Como. Overnight at the hotel. Breakfast at the hotel. Short visit of Como. An amazing small province rich of atmospheres, panoramas, and human takeovers. 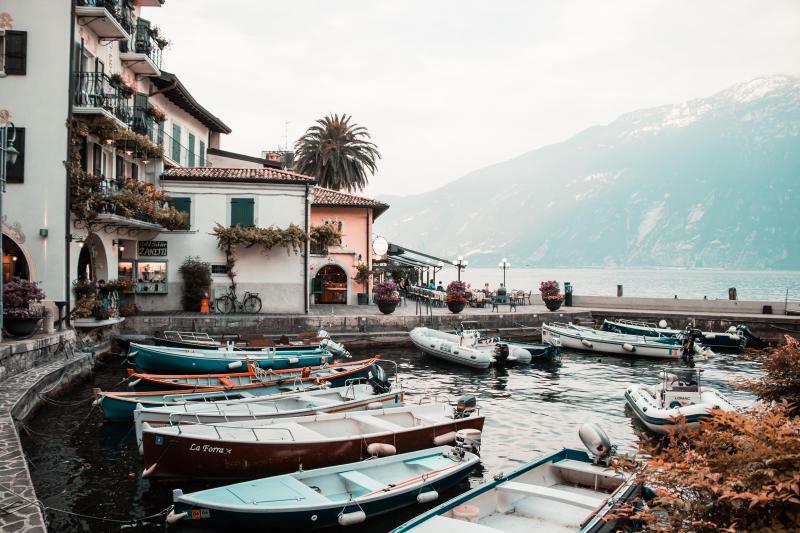 In little kilometres, you can admire the high mountains over the lake, the wild alpine valley and the industrialized brianzola area, the city area of Como and the villages of little houses. Lake Como. It has been famous for its setting at the intersection of the three branches of the Y-shaped lake, and it is also known as Lario. Board the boat we reach Bellagio, situated at the tip of the peninsula separating the lake’s two southern arms, with the Alps visible across the lake to the north. Divided into three branches, is situated on the most renowned beach on the Italian landscape. It is a picturesque village with small streets, luxury hotels and villas and gardens visit. Before lunch, we invite you to try a Prosecco as a welcome drink to Bellagio in a typical wine cellar. Free time for lunch. Breakfast at the hotel and visit to the famous city of Verona. This town is known all around the world for its Coliseum called Arena and main symbol as Juliet balcony, that represents the most important love-story of the literature, written by Shakespeare and inspired to real facts of the two enemies Verona families. We’ll visit the old square of the market, Piazza delle Erbe, surrounded by some of the most famous buildings, like Torre Lamberti, the City Hall, the tribunal. Free time for lunch. Next, departure to Cortina d’Ampezzo with a route through Val di Fiemme, Val di Fassa and Passo Pordoi, some of the most wonderful valleys of the Dolomites area. This region includes many small villages typical of a mountain setting. We stop in Canazei, important place for tourism in all seasons, due to the wonderful view given by this part of the Dolomites that call thousands of tourists every month. Short visit. Breakfast at the hotel. A route through the several Dolomite Pass: Passo Falzarego which is situated in the basin that surrounds Cortina. Between Val di Fassa and Val Gardena, it gives us a marvellous view, both in winter and summer. Through Passo Costalunga, we arrive at Lake Carezza. Stop to have a look at this wonderful lake. Free time for lunch. Then, departure to Merano, second biggest city of the province after Bolzano. Famous worldwide for its Christmas market, Merano is also a charming and amazing cultural and historical centre. Visit the old town and free lunch.